Request a T-Shirt quote or place an order by clicking on a design below. We can make any modifications you request to our designs with unlimited revisions. No artwork fees. It's fast and easy! Custom T-Shirts for Children's Ministries, Preschools, and events. Browse our designs or call if you need a specific theme. Like us on Facebook to new design updates. All designs on this Web site are property of ChurchTrends.com and are Copyright protected. Visit us on FaceBook for new designs and special offers. 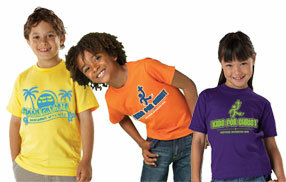 Custom Kids T-Shirt Designs Choose one of our cool T-Shirt designs or submit your own design for print. assist with your T-Shirt order. mission trips, retreats and more. Kids camp t-shirt designs. All summer t-shirt designs can be modified or our in-house art department can also create a layout based on your idea or concept. T-Shirts for christian camps, kids camp Tees, summer retreats, etc. ChurchTrends is 2013 summer camp Tshirts specialist. Teen Summer Camp T-Shirts, custom summer camp t-shirts, personalized summer camp shirts, personalized t-shirts for summer camps, christian camp t-shirts, inexpensive summer camp tshirts, cool summer camp shirts.